Promotion Division, FAS, (202) 447-7103. 1093 Wheat Flour (Saudi Arabia). Wants wheat flour, about 2,000 tons quarterly. presently engaged in importation of wheat flour and other food grains. Jidda, Saudi Arabia. Telex: 403803 MISAN SJ. Phone: 643-4227. Nigerian and 401 Foreign. Total investment envisaged 3 million dollars. A/D Zaan, Netherlands. Telex: 19027. Phone: 75/127540. B1, Max. 5 PPB total of aflatoxin B2/Gl/G2. Quote CIF European Port. Importer also interested in snack items; food specialties, canned or in jars. Supplies retail and HRI trade. Bank ref: Swiss Credit, Zurich. Contact: P.
Baldinger, Gustav Gerig & Co., Ag., Postfach, 8035 Zurich, Switzerland. Telex: 55305 GERIG CH. Phone: 01-362 00.62/362 33 40.
omn 4945 South Building, Washington, D.C. 20250.
preference. Quote CIF Beijing, China; by sea to Kinkang Tianjin, China. Holdings Ltd., 22/F Hutchison House, 10 Harcourt Rd, Central, Hong Kong. Telex: 73176 HILHK HX. Phone: 5-212281. 8864, Jidda, Saudi Arabia. Telex: 402723 RAJICO SJ. Phone: 667-3692.
to manufacture various brands of food products by interested U.S. Harvest Foods Ltd., P.O. Box 70126, Ndola, Zambia. Telex: ZA 34350 SUGAR. Mexican food, institutional. Firm supplies restaurants. Contact: Hans W.
Jany, In Der Ohe 17, 3016 Seelze 5, West Germany. loads. Quote CIF R'Dam/A'Dam. Bank ref: NMB-Amsterdam. Contact: P.J. Amsterdam, Netherlands. 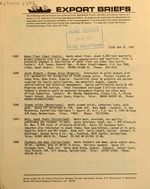 Telex: 18717 (MOCK). Phone: 020-114736.
from country of origin required. Quote CIF La Guaira, FOB New York or Miami. Bank ref: Banco Consolidado, Caracas, and Banco Provincial, Caracas. 78239 La Urbina, Caracas 1070-A, Venezuela. Telex: 25262 COLUM VC (Telex). Jaime Maria Buch, 2 (ENTLO. ), Alicante-5, Spain. Telex: 66788 ODEC E.
Phone: (965) 12 11 00. Soublette, P.O. Box 3775, Caracas 1010, Venezuela. Telex: 22829 MAOLV VC. Cable: MAOLVI. Phone: (02) 41-0453 or (02) 41-0918. 40821, Caracas 1040, Venezuela. Telex: 28019 ATICA VC. Cable: AGETRAIN. protein content, bulk. Delivery ASAP, last half of July, 1982. Calle 72 No. 64-155, Medellin, Colombia. Telex: 6681. Phone: 570288. B.I.C.O. Contact: Hotait Ghazi, Port De Peche, Rue Des Filets, 01 B.O. interested in bidding on this tender should request specs. via telex. U.S.
Inter-Marketing A.G., Herenstraat 31, 1211 Bz Hilversum, The Netherlands. Telex: 73497 (INTER). Phone: 035-13473.
bags. Quote GIF Antwerp. Delivery date ASAP. Bank ref: Kredietbank. Contact: Mr. Van Hove, TEST, Rue du Brabant 8, 1000 Brussels, Belgium. American Line. Contact Mr. Jezierski for further details. powder and in flakes) and diced potatoes. Bank ref: Credito Comercial. 1123 Dried fruits (Hong Kong). Dried fruits wanted, minimum quantity, Grade A.
Yemen Arab Republic. Telex: 2488 HABARI YE. Office, Room 5530-South Bldg., Washington, D.C. 20250; or phone (202) 382-1318. Two Food Additives Restricted in Japan. laboratory tests have indicated they may be carcinogenic.